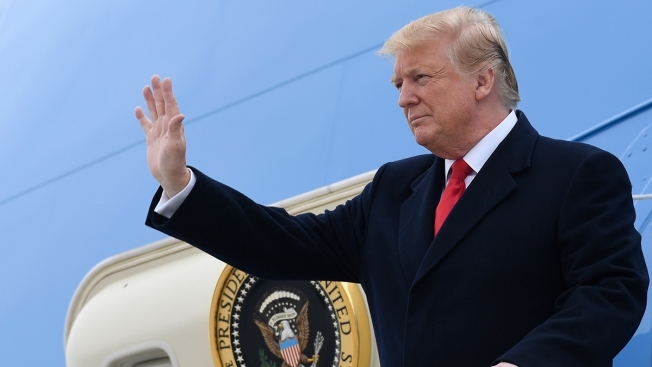 President Donald Trump walks down the steps of Air Force One at Minneapolis-Saint Paul Air Reserve Station in Minneapolis, Monday, April 15, 2019. Top administration officials have been discussing ways to increase pressure on countries with high numbers of citizens who overstay short-term visas, as part of President Donald Trump's growing focus on immigration heading into his re-election campaign. The administration could introduce new travel restrictions on nationals from those countries, according to two people familiar with the plans who spoke on condition of anonymity because they were not authorized to disclose private conversations. The idea, which was first reported by The Wall Street Journal, is just one of many under discussion by an administration that is increasingly desperate to satisfy a president who has been angry about the influx of migrants at the border as he tries to make good on his 2016 campaign promises and energize his base going into 2020. The ideas have ranged from the extreme — including Trump's threat to shut down the southern border and consideration of again separating children from parents — to more subtle tweaks to the legal immigration system, including efforts to clamp down on visa overstays, which, according to the nonpartisan Center for Migration Studies, exceed illegal border crossings. 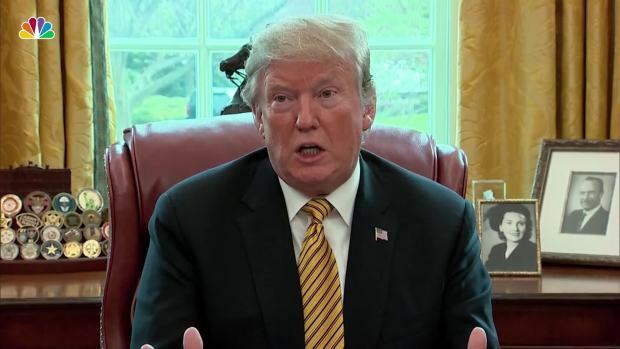 President Donald Trump backed off his initial push to close down the southern border between U.S. and Mexico Thursday and instead threatened to impose tariffs on cars manufactured there. Plans are also in the works to have border patrol agents conduct initial interviews to determine whether migrants seeking asylum have a "credible fear" of returning to their homelands. Border patrol agents are the first officials who come into contact with migrants, and the thinking is that they'll be less sympathetic than asylum officers. And officials have been considering raising asylum standards and changing the court system so that the last people in are the first to have their cases adjudicated. Some of the ideas have been proposed, rejected and then proposed again. The administration has also been weighing targeting the remittance payments sent home by people living in the country illegally. And White House aide Stephen Miller in particular has been pushing Homeland Security officials to move forward with plans to punish immigrants in the country legally for using public benefits, such as food stamps. White House spokesman Hogan Gidley said both are topics of focus for the White House. "It is a top priority for the administration, as has been for two years, to reduce overstay rates for visas and the visa waiver program — and it's well known that the administration is working to ensure faithful implementation of immigration welfare rules to protect American taxpayers," he said. At the same time, Trump suggested Monday that his threat to send migrants to so-called sanctuary cities in an apparent effort to exact revenge on Democratic foes is taking effect, even though it remains unclear whether such a plan is feasible. "Those Illegal Immigrants who can no longer be legally held (Congress must fix the laws and loopholes) will be, subject to Homeland Security, given to Sanctuary Cities and States!" Trump tweeted just days after aides insisted the plan had been shelved. President Donald Trump went to Calexico, California, on Friday to meet with ICE officials and talk about immigration. During a roundtable discussion, Trump said the "country is full" and suggested people trying to reach the U.S. "turn around." Neither the White House nor the Department of Homeland Security responded to requests for comment on what, if anything, had changed Monday. And it's unclear whether Homeland Security has taken any steps to implement the contentious plan. Lawyers there had previously told the White House that the idea was unfeasible and would be a misuse of U.S. Immigration and Customs Enforcement funds. ICE is already strapped for cash and resources, and some believe such a plan would actually end up doing the migrants a favor by placing them in locations that make it easier to for them to put down roots and stay in the country. Trump has recently gutted DHS's leadership amid frustrations over agency pushback against the White House on immigration matters. Democrats on Monday demanded that White House and agency officials turn over internal documents on the administration's deliberations over the sanctuary city plan. "Not only does the administration lack the legal authority to transfer detainees in this manner, it is shocking that the president and senior administration officials are even considering manipulating release decisions for purely political reasons," read a letter signed by three House committee chairmen. Trump, meanwhile, has insisted he has "the absolute legal right to have apprehended illegal immigrants transferred to Sanctuary Cities." He continued to rail about the situation at the border during an appearance in Minnesota on Monday and made the case that the issue could be a winning one for Republicans in 2020, telling the crowd that the GOP could "retake the House" over this issue. Many moderate Republicans urged Trump to avoid harsh immigration talk in the lead-up to the 2018 midterm elections, warning that it could hurt the party's chances, especially in the suburbs. The Republicans wound up losing the House. U.S. officials say a flood of migrant families, largely from Central America, is overwhelming the southwestern border. The U.S. Border Patrol said the 53,000 families apprehended in March set a record, though Democrats say the administration is worsening the problem by aggressively detaining people caught entering illegally and limiting the number of applicants for refugee status who are processed. Associated Press writer Alan Fram contributed to this report.